This is a review of ScentSationals Wax Melts from Walmart from Spring 2018. 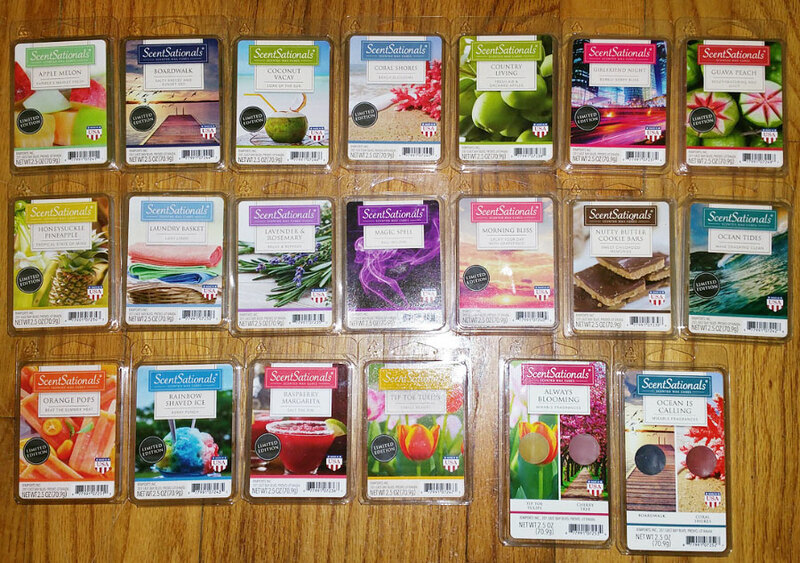 ScentSationals wax melts can't be beat in terms of scent quality, throw, and that $2 price! A nice delicate cherry blossom scent with maybe a hint of baby powder and soapiness. Notes: Ripe orchard apples, crisp green Granny Smith, and sugary Jon gold blend with luscious watermelon accents amid sweet cantaloupe, sugared honeydew, and glimmers of ripe casaba. I smell sweet watermelon and cantaloupe (cantaloupe is similar to watermelon but has a tinge of a sour note). I don't smell apple. This one is soapy and a little fresh with a little bit of a sweet watery note and a perfumey note and maybe a hint of baby powder. There might possibly be a barely detectable smidgen of coconut way in the background, but I'm not sure. When melted though, the perfumey note is much more subtle and it takes on more of a soapy note that's not overly sweet. It's quite pleasant and I like it. Notes: Candied coconut flakes atop decadent vanilla pound cake finished with sweet vanilla buttercream accented with sugar strands. This smells a lot like last year's Better Homes & Gardens Island Coconut Lime, but they're not exactly the same. Island Coconut Lime is a coconut scent with a bland soapy note (but not in a bad way) and a hint of lime. The new Coconut Vacay is a lime scent with a coconut note. It's more limey, and I'm pretty sure it also has lemon in it, as it's more zesty than lime. It also has a richness, not like a creamy richness, but a slightly savory richness. It's a little sweet but not really a "sweet" scent. It smells fantastic, and although I also like the Better Homes & Gardens Island Coconut Lime scent, I like Coconut Vacay more. The first cube I melted, throw was medium, 3 to 3.5 out of 5. A few days later I melted a second cube and throw was strong, 3.5 to 5. Same clamshell! Which proves that there are a lot of things that affect throw. Looking at the scent notes, apparently there's no lime in this one, but I definitely smell lime first! Notes: Shimmering greens, sweet mango, and sugared pineapple blend with fragrant beach blossoms, hints of night-scented jasmine, and wild rose above ambered vanilla and rich musk. A nice pleasant light coconut scent with a hint of fruit (strawberry with a tropical note? ), and maybe a smidgen of floral. It's not overly sweet. I think I've smelled this one before, but it's not the same as a lot of similar scents I have, such as Better Homes & Gardens Caribbean Sea Breeze (which has different notes and is not as coconutty), ScentSationals Ocean Tides (which was sweeter and had a honeydew note, although when melted it does smell quite similar), or ScentSationals Passion Fruit Coconut (which was richer with a vanilla note and less fruit). Looking at the scent notes, I don't smell pineapple at all. Notes: This alluring fragrance creation blends Macintosh apple and fir needle with citrus and crisp eucalyptus accords. Siberian pine, pear blossom and rosemary oil add balance in the heart while applewood, fresh cedarwood and musk create a warming backdrop. This is a fantastic fresh authentic apple scent, similar to Better Homes & Gardens Fresh Orchard Apples and ScentSationals Juicy Apple (from Meijer). This apple scent, however, is slightly more crisp and slightly less sweet, like a Granny Smith apple. And if you sniff all 3 apple scents side by side, you'll notice that this scent has a smidgen of pine way in the background. It's too subtle to notice by itself, but it's that pine note that differentiates it from other apple scents and gives this scent a rich note. Even so, it's hard to tell the difference between this scent and other authentic apple scents. Looking at the scent notes, there's the pine! The label says "Bubbly Berry Bliss", which sounds like this should smell like a fruity champagne, but not at all. It's a super sweet girly perfume scent that smells like pink sugar (a very sweet girly scent that smells a bit like cotton candy, with lily of the valley, vanilla, musk, and faint raspberry notes) but with more musk and maybe a slight blackberry note. I've heard that it's very similar to a Juicy Couture perfume. It's VERY sweet, almost nauseatingly so, but I like girly perfume scents so I love this one! Looking at the notes, I don't smell smell orange per se. Notes: Sunny island guava blended with sweet nectarine and juicy peach, a burst of sliced mango and ripe lychee fruit swirled with pure cane sugar. A nice sweet tropical fruit scent. I smell the guava but not the peach. There's also a hint of a sweet floral note, and a hint of strawberry I think. There's also a very subtle sour note, but not overkill like some tropical fruit scents. I did smell that sour note a little more as time went on, but it still wasn't too much. Notes: Island pineapple, crisp melon, juicy berry, and ripe kiwi brighten dewy honeysuckle and white orchid wrapped in soft musk and sheer ozone. It's pineapple. The pineapple is on the sweet side. I don't smell honeysuckle at all, just pineapple, but other people who have smelled this do detect the honeysuckle. Notes: Egyptian cotton and freshly laundered linen join bright notes of effervescent citron, white aldehydes and the richness of lush greens over translucent musk and warm, ozone-infused woods. A very nice pleasant soapy scent that smells like a combination of fabric softener and bubble bath. I think there's a hint of musk in this scent which makes it smell a tiny bit like ScentSationals Egyptian Cotton, but not nearly as sweet or perfumey. Notes: Freshly picked lavender blossom accented with rosemary, soft citrus highlights and gently crushed clove. A fantastic authentic lavender scent. It has a slight medicinal note due to the rosemary, but not enough to be bothersome. It has just a smidgen of sweetness, but it's not a soft, powdery, sweet lavender scent. Very nice, and a great mixer; it would mix well with lemon or lemongrass to make a nice spa scent, or with a floral or perfumey scent. This is a dupe of Victoria's Secret Love Spell perfume and I don't like it at all. It smells like Scentsy Lucky in Love and Tuscany Stressless (both of which are also Love Spell dupes, so I don't like them either). It smells very bland to me, and not very sweet, like bitter grapefruit and wax paper. But I think I'm in the minority in my dislike of this scent, as most people seem to love it! Looking at the notes, I don't smell ANY of them! Notes: Shimmering bergamot and tart grapefruit zest splash over sweet lychee accented with pure peony balanced by white musk undertones and sheer touches of pink jasmine. This is pure grapefruit, and I love it. It's both a little sweet and sour, and there might also be a bit of orange in this one. When melted I also detect a bit of zestiness, which might be lemon. This scent is similar to last year's ScentSationals Hello Sunshine, which is also a grapefruit scent, but that scent was slightly sweeter and had an orange note. Notes: Chocolate chips and Nutter butter cookies stirred with vanilla essence and sweet brown sugar. The picture on the label shows what looks like peanut butter bars with chocolate frosting. I do smell chocolate with a slightly peanut buttery vanilla. It's not a harsh bitter dark chocolate though. It's a nice scent but a bit artificial. Notes: Sparkling ozone and sea salt drift over floral jasmine, cyclamen, and tender lily touched with hints of tropical peach and warm, musk-infused woods. This is the same scent as the new AmbiEscents Maui Beach, which is the same scent as the old ScentSationals Calypso Sands, a fantastic sweet watery scent with honeydew, floral, vanilla, and a hint of coconut (label says "light floral and honeydew on a fresh breeze"). I'm sniffing them side by side, and if they're not the same scent, they sure are close. It's one of my favorite scents. Looking at the scent notes, they're not the same as Calypso Sands. Notes: Refreshing mandarin takes a unexpected turn in this warm, spicy citrus delight. It's orange. What else can I say? I like it, but I like all orange scents, and this one is a bit one-dimensional, just orange with nothing else. It's not overly sweet, but it's not sour either, and it's not intense like ScentSationals Molten Orange, and it's not a creamy orange like an orange creamsicle. There may be a hint of grapefruit. A super sweet slightly fruity chemical scent with a weird very bitter chemical note that makes it smell like cough syrup. It smells a little like ScentSationals Rock Candy, but with the addition of that bitter chemical note. It doesn't smell like shaved ice, but more like a thick rich sugary syrup. Well, like cough syrup. It smells a little better melted than it does on cold sniff. I think adding vanilla or a real fruit scent to this (even lemon maybe) would make it smell better. This is a weird one, and it might be one that people love or hate. It smells like raspberry and eucalyptus! It might be a dupe for an older Christmas scent. It smells like strong medicinal cough syrup with a thick sweet fruity taste, or raspberry flavored eucalyptus cough drops. I just asked a friend what it smells like, without telling him the name of the scent. He said cherry cough drops. It's such a strange combination that sounds awful together, but I actually really like it. It's refreshing! And the scent lingered in my room for a day after I turned off the warmer. Looking at the scent notes, the eucalyptus I think I'm smelling is probably the "wild mint", which I guess is more of an herbal garden mint rather than spearmint or peppermint, although I don't actually smell mint per se. Notes: Spring has arrived! Sweet jasmine and rose over raspberry and orange blossom. Touched by spicy greens and softened with vanilla. This is a fantastic floral scent that smells like rose and honeysuckle with a little bit of a soapy note. It's not overly sweet and it doesn't smell like perfume; it's actually quite an authentic floral scent. Looking at the scent notes, I don't smell raspberry, but there might be a barely detectable fruity note.